My entry for this weeks challenge is a bit late, well late for me. I’m sitting in my study looking out into the garden on a rainy public holiday day (why does it always rain) and I’m behind schedule. I’ve got three projects on the go, four if you count this one and I’m running out of time, fast. This weeks image was taken in Den Bosch in the Netherlands. I’d flown in from the UK, early morning on a business trip and had the afternoon to kill before catching the evening flight home. Bicycles typify the Netherlands for me, they’re everywhere, in the towns and cities and the country. 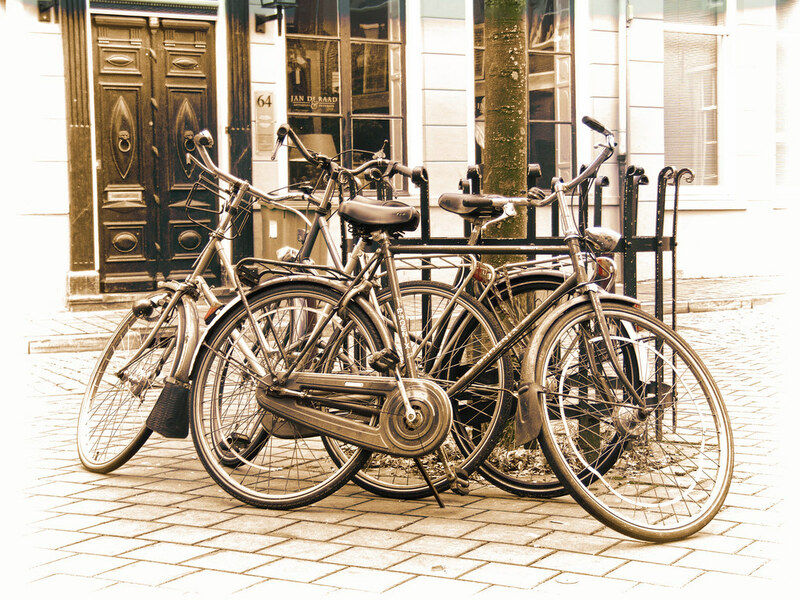 Cycling in the Netherlands is a common and popular method of transport and recreation, accounting for 27% all trips nationwide, and up to 59% of all trips in its cities. One of the scariest moments I’ve ever had when driving involved bicycles.”Strict liability”, supported by law in the Netherlands, leads to driver’s being deemed to be responsible in a collision between a car and a cyclist. I had the misfortune to drive through the centre of Eindhoven just as employees at the old Philips Electrical factory were leaving for the end of the day. Hundreds of bicycles in front, behind and to the sides, some just inches away. Worse still they were cutting across my path as well. Absolutely frightening.. Anyway back to the photograph. As I had time to spare I took my camera for a walk through the old part of the town. As many towns in the Netherlands are closed to cars you see bicycles in use everywhere, but they have to be parked somewhere.and the image above is typical. For me it made a great photo opportunity. Hey! I didn’t use the word “Urban“ once.. Scary to think of all those cyclists suddenly appearing! Great post and photo – and thank you for the pingback! Thank you for visiting the site and liking my Urban Weekly Challenge submission and posting a link to my submission on your website. Words can’t quite express how I feel about that honor. I love bikes. Great shot!